Since his release he has been repeatedly harassed and taken in by police for questioning. He has served a further three months in prison for talking to foreigners, which he continues to do in spite of the restrictions. However Vanunu has repeatedly insisted that he has no more secrets to tell, including in his first public statement to the throng of international reporters gathered to cover the moment that he emerged from prison on April 21, 2004. He shared all that he knew with UK Sunday Times journalists back in 1986 (information that is now more than 28 years old) – giving the world its first photographic proof of Israel’s clandestine production of nuclear weapons at the remote Dimona factory where he had worked as a technician until 1985. He strongly believed that in a democratic country, people have the right to know what their government is doing, and, after examining his conscience, felt it was his responsibility to share the information he had. On the eve of publication, Vanunu was lured from London to Rome by a Mossad agent, where he was kidnapped, drugged and bound and put on a freighter to Israel. A secret court convicted him of espionage and treason. 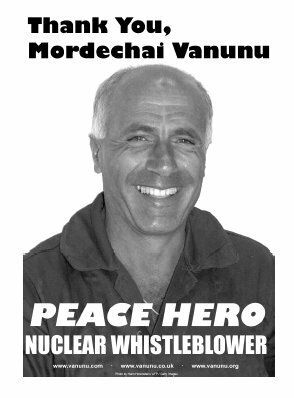 We believe that Mordechai Vanunu is a hero for his courageous act of whistleblowing, not a traitor or a spy. And we think it’s likely that Israel would view a potential Iranian nuclear whistle-blower in the same light. In any case, it is time for Israel to stop this endless persecution of Vanunu. He is currently living in East Jerusalem, but very much wishes to leave Israel and start a new life. As we continue to work for a nuclear-free future, we invite people around the world to join us as we call on Israel to do the right thing, morally and legally, and finally lift Vanunu’s restrictions without further delay, ten years after the original court-imposed sentence for his “crime” has expired. Mordechai Vanunu must at last be given his freedom.